UN Commission on the Status of Women opening session, March 2019. Photo: Li Muzi/Xinhua News Agency/PA Images. All rights reserved. 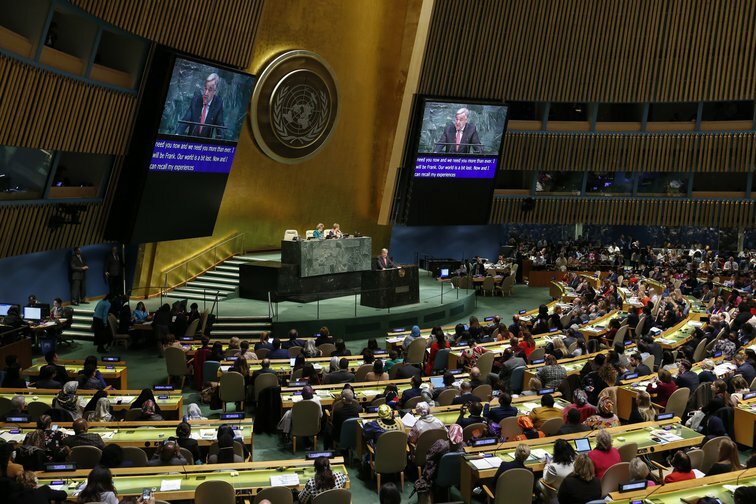 Several news outlets have noticed the rather ironic selection of Iran to a United Nations’ body dedicated to “gender equality and the advancement of women”. Especially as this happened on the same day as an Iranian court sentenced Nasrin Sotoudeh, a lawyer who represented women charged for protesting the mandatory wearing of the hijab [ see: https://humanrightsdefenders.blog/2019/03/12/iran-cracks-down-on-nasrin-sotoudeh-and-other-human-rights-defenders/]. No Commission on the Status of Women (CSW) member-state raised an objection or called for a recorded vote, and Iran got the post. There is perhaps not much substantive meaning in this position and other ‘contradictory appointments’ have occurred in the UN, but it remains a public relations disaster for the UN. The US, Bahrain and Malaysia have reiterated during this week’s CSW discussions that the family – not the state – is the main source of social protection for many women. This is what I’d call a ‘family fallback’ approach which, combined with cuts to public services, requires women to expand their mothering roles to pick up the slack. Some countries, including Russia and Saudi Arabia, defend this maternal focus as a national cultural preference. The US is now among those supporting this view, arguing that any proposals on women’s rights should only be applied ‘as nationally appropriate’. This allows the notion of ‘national sovereignty’ to trump global standards on gender equality. But the US position is so extreme that Shannon Kowalski, advocacy and policy director at the International Women’s Health Coalition, told me it’s expected that “major fractures will emerge” even with its conservative friends. Few developing countries can stomach the Trump government’s drift towards abstinence as the foundation of family planning. Moreover, the US’s refusal to participate in the 2018 Global Compact for Immigration discussions has alienated countries such as the Philippines, Mexico and Indonesia, which have proposed, for instance, that social security benefits earned by immigrant women should be portable and redeemable when they return home. A diverse counter-movement against the current global ‘illiberal drift’ is also visible at this year’s CSW. The ‘Buenos Aires Group’, consisting of many South American states (notably Argentina, Chile and Uruguay), has emerged as a defender of LGBTIQ rights and a skeptic about privatisation of public services. This year Tunisia and Lebanon, in the Arab states group, and South Africa, Namibia, Liberia and Cape Verde in the ‘Africa Group’ of countries, are championing progressive positions on women’s rights as well. This support from the Global South vitally shows that the gender equality agenda is not just the concern of the usual suspects in the North – Canada, New Zealand, Australia, Iceland, Norway, Liechtenstein and the EU. This entry was posted on	March 18, 2019 at 11:52	and is filed under human rights, UN.